We all know how tasty and addictive a barbecue can be. And, the Traeger Renegade Elite Grill is no different. Initially, it's purpose was to slow cook hogs. However, as innovations took place, different meals came along. It made barbecue grills common in most societies today. However, to enjoy great meals cooked in this kind of style, we should understand it takes more than just skillful grilling to get the best meals. The kind of grill used matters too; we can't enjoy cooking if the rack is poor. It is why we have done our homework trying to find out the best grill that is standard and suitable to produce the best meals. Traeger Renegade Elite is one of the best grill product from Traeger Company. The company is based in the US and has been the pioneer of pellet grills for over 30 years now. Furthermore, the company took hold of the pellet grilling technology patent, which made it dominate the market for years. However, as the technological advancement has taken a new pace, the pellet grill market has undergone competition changes recently. Thus, it made the company come up with new improved and upgraded grills to kill the competition. Here are some of the features of the new Traeger Renegade Elite grill. 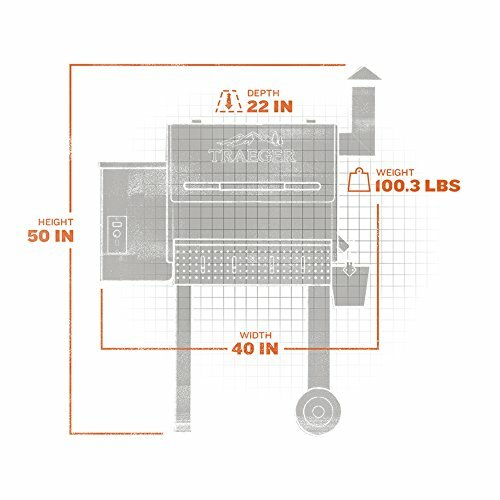 The grill has 380 square inches of grilling area; this makes a right size for a family meal. Space accommodates multiple meals at once. This size ensures perfect quantity and perfect energy consumption for the grill. Has a tool caddy rack. It bothers people to be running after different tools required while the grilling is in the process. With this feature, all your grilling tools will be in one convenient spot. Wire Front Prep rack; this is another great feature that comes with Traeger Renegade Elite grills. This front prep rack allows you to prepare the food before going into the grill. It also serves as receiving a spot of the food from the tray; it may be for testing purposes or serving purposes. 100% pure hardwood pellets fuel this grill; the meals from this kind of wood-fired grills have a peculiar taste. The feeling that neither gas nor charcoal can provide. The Traeger hardwood pellets are from real hardwoods without any binding agents or fillers. It produces the beautiful wood-fired flavor which is extremely hard to get elsewhere. It has an elite digital controller; this feature has made the grill setting just as easy as oven setting. This elite digital controller enables the user to maintain the temperature of the grill within -/+ 20 degrees. It allows you to slow cook on the smoker. You can quickly read the temperature clearly and promptly through the LED display on the grill. Electronic auto start ignition. It eliminates all the needs of dealing with fire starters and charcoal chimneys; there is no need to light your grill with a match. The auto switch enables one to flip either on or off, and your Traeger is up running and ready to start grilling. Furthermore, even though the Traeger Renegade Elite is different from the rest of the grills, the prices are truly affordable. You can get this grill at a fair price and also enjoy the cost-effective grilling. It is because the fuel used in grilling is affordable and sustainable. Over the years since its invention in Mt. Angel, Oregon Traeger continues to lead the device in the industry as the world's number 1 selling wood-fired grill. Namely, their years of experience makes the company perfect in its skills and mastering the craft of wood-fired grills. The 100% hardwood pellets and digital controller, means one can move from slow cooking too hot and fast grilling. Additionally, unlike Traeger Renegade Elite, the Lil'Tex Elite has more full legs to give it more stance and balance. It is also due to its more significant grilling area of about 418 square inches. Moreover, the straightforward steel construction design makes it a masterpiece of its kind. Here are more features of the Lil'Tex Elite Grill. It has 418 square inches of the grilling area; this enables a family size meal accommodation. One can also invite friends and enjoy the barbecue experience without any issue. Not only that but it also allows the user to prepare more than one type of meal at once. Have an elite digital controller with LED display; this enables easy temperature control and maintenance. The digital display will show the user of the current temperature, hence allowing the user to precisely control the heat just like using an oven. 100% hardwood pellets fuel real 100% hardwood pellets fuel; compared to Traeger Renegade Elite, the Traeger Lil'Tex elite grill. Hence, this enables it to be very efficient at producing enough energy for the meal. Not only that, but it also affects the meal and provides a magnificent taste of one's meal. This kind of feeling is one which is hard to come by. Has an electronic auto start ignition; with this feature, it provides an easy way to fire up the grill. One doesn't need the traditional light up a method to kick-start the rack and start enjoying the meals. The grill is easy to clean; the porcelain grill grates are easy to clean due to the non-stick surface. This makes it easy to maintain the cleanness of the grill while enjoying the great meals. These are some of the great features that make Lil’Tex Elite grill among the best products from Traeger Company just like Traeger Renegade Elite. It will give your grilling a new experience and enjoyment. The prices are also very affordable despite that the quality and standard is incomparable to the cost sold. The pellet grill pro series is one of the best products available on the market. Its larger grilling area of 567 square inches offers the users opportunity to cook varieties of meals all at once. Has a larger space of about 572 square inches; this is larger than even Traeger Renegade Elite, it enables the user to prepare varieties of meals at the same time. It also allows a family size meal or even a more prominent family. Not only that, but you can prepare meals for a friend, even when hosting a small barbecue party at home. Has a fully automated auger; this enables the user to operate the grill without any problem quickly. This feature also allows the user to maintain the quality of the meals each time he/she prepares it. Can cook up to 450 degrees; the temperature varies to 450 degrees, enabling the user to cook any desirable meal. Uses 100% hardwood pellets; this hardwood fuel enables the grill to be very efficient as well as provide the meals with a unique taste. Unlike the gas and coal-fueled grills, this one offers uniqueness to the cooked products. Again the hardwood fueled rack is easy to operate and maintain. Easy to maintain cleanness; the kind of materials used on this Traeger pro series are non-sticky materials which enables one to maintain cleanness without any hustle. The bronze top is easy to clean; the porcelain grill grates are also easy to maintain. Additionally, the price of the grill is quite affordable despite all the great features. 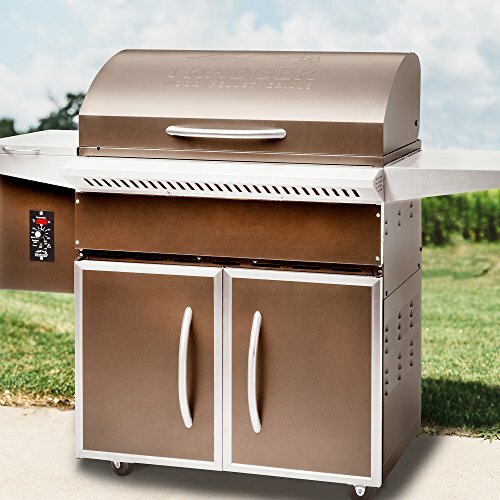 One can visit the store and enjoy the new grilling experience that comes with the pro series. Has an area of 300 square inches grilling area; this area is enough for a family to enjoy their meals comfortably. The grilling area can hold up to 12 burgers, 18 hot dogs, four whole chickens or even three racks of smoked ribs. This is enough for a family or even a group of friends getting together. Has a digital Elite Controller; the enables one to quickly set up the grill just as one sets up an oven. This controller allows for one to maintain the precise temperature within -/+ 20 degrees. It will enable one to slow cook on the smoke setting to hot and fast 450 degrees of heat. 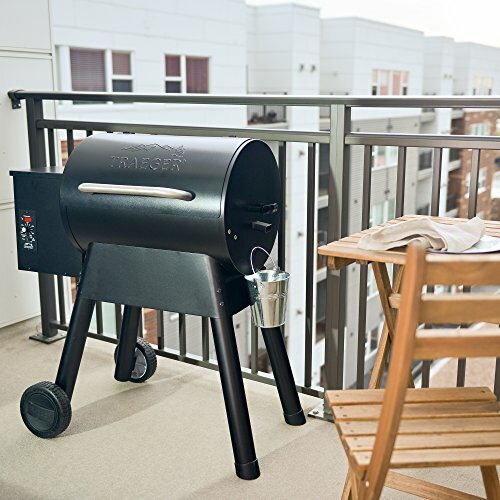 Has a 6 in 1 versatility; The Bronson wood pellet grill, along with Traeger Renegade Elite and many other Traeger grills have 6 in 1 versatility, which allows the user to cook different meals at one and be able to maintain their great flavor. One can grill pizzas, a rack of ribs, baked a homemade apple pie. No matter what you cook, the feeling will still be magnificent. You can bake, smoke, braise, roast or even BBQ and experience the delicious taste of the meals prepared. The electric auto starts ignition; this enables one to avoid dealings with traditional fire starters. With the auto-start ignition, there is no need for charcoal chimneys anymore. One can flip on/off, and the Traeger will be up and ready to go. Have all-terrain wheels to enable smooth movement of the grill; these all-terrain wheels are durable to allow the transportation of the rack even over the rocks. The added side handle makes the transportation incredibly easy to manage. You can move the Traeger through gravel, dirt, or even over the pavers smoothly with these wheels. Has Sawhorse Chassis; thanks to the excellent sawhorse design that has made Bronson 20 wood pellet, one can grill with confidence for more years to come. The sawhorse chassis has enabled the grill to be more stable and last longer. The Bronson 20 wood pellet is greatly designed to feed the needs for grilling, baking, roasting, and so much more. This is one of the products from Traeger with great features incomparable to the price. The Bronson 20 wood pellet grill is affordable to those who need to change their grilling experience. Among the classic grills from the Traeger Company is the Select Elite Grill. Just like Traeger Renegade Elite, the classic grill style meets the wood-fired flavor. The rack is made up stainless steel side shelves, with a double door storage cart. Not only that, but the tray has an increased wood-pellet hopper capacity that makes it unique. The temperature setting of the grill is easily maintained and controlled with the aid of the integrated digital elite controller. The grill has 586 square inches grilling area; this is one the great features that come with the Select Elite grill. It has an elite digital controller; with this controller, one can set up a grill just as easy as setting up an oven. The Digital temperature controller maintains the precise temperature within the -/+ 20 degrees just like using Traeger Renegade Elite. It will allow the user to cook low and even slow on the smoke setting, or rather hot and fast of up to 450 degrees. The temperature can be read quickly and precisely through the LED display that is built on the grill. It fuelled by pure 100% hardwood pellets; these pellets are made of virgin and pure hardwood with no binding agents or fillers. The meals produced have a delicious wood-fired taste compared to the gas and charcoal grills. Traeger hardwood pellets are efficient to provide the best meals. Have a three-piece porcelain grill grate; this non-sticky surface like that found in Traeger Renegade Elite enables the grill to be easily cleaned, even after smoking juicy burgers or even a saucy rack of ribs. The fact that the cleaning is natural makes it possible to fast clean and keep on enjoys delicious meals with family and friends. Has a proper enclosed storage space; the select elite grill has a double door storage space, this will keep your pellets dry and grilling gear close. Space can fit in comfortably up to 2 bags of pellets right below the grill so that the fuel source is ready to be refilled whenever needed. When Traeger ran out of pellets while cooking, one can refill quickly. Has stainless steel side shelves; the shelves are made of stainless steel that is easy to clean and are more durable. They can tolerate all weather without wearing out. This spot is perfect for the preparation of the food to be grilled or a perfectly cooked steak before serving. It is made up wheels with locking casters; the select elite wood is made up of easy-glide wheels, this makes your grill mobile when one needs to relocate. It is also made up locking casters to ensure it stays still when you park it. The versatility of the grill; whether it's grilling a fried pizza or slightly smoking a rack of saucy ribs to even baking a delicious homemade apple pie, you can do it all with Traeger's select elite grill 6 in 1 versatility. No matter what you cook, grill, roast, braise or BBQ, it will all get the amazingly Traeger wood fired taste. You shouldn't spend on only a rack, while you can do it all with this fantastic product from Traeger. The Select Elite Grill is one of the best in all the products from Traeger, due to its classical features. Like the Traeger Renegade Elite even with these standard features, the grill is still very affordable compared to what it offers to the users. You can opt for the Select Elite grill and experience classic grilling with family and friends. Traeger is the first to introduce the modern pellet smokers. The great edition of BBQ smoking is one of its kinds in the BBQ world. After their introduction to the market starting with the Traeger Renegade Elite, they quickly gained popularity due to their unique features, and high efficiency in producing great meals. This popularity grew faster because they were made to be able to operate in both competition level cookers and backyard smoking. The best thing about these smokers is that they are easy to use and also produces excellent meals. So we shall be taking a look at the Traeger Junior Elite features, and what makes them this great in the market today. When we talk about pellet smokers, we mean the ordinary grills like Traeger Renegade Elite that can be used for smoking. It is by heating using high and small energy wood pellets. The in-built digital controller enables this grill to monitor temperature variations, and maintain its set temperature automatically by feeding pellets to the fire pot, to ensure the temperature of the smoker is maintained. One the reason for their preference for the individuals is due to the classic flavor that is produced by this grill. The grills are created in very peculiar quality to ensure its endurance and durability during its lifetime. Traeger Junior Elite design follows the trend of Traeger Renegade Elite and all the other Traeger pellet smokers. It has a built-in the digital controller which makes the smoker able to maintain the set temperature, which one would like to operate on. Furthermore, the primary function of this controller is to send signals to the auger to deliver to the fire pot from the hopper. Additionally, the fire pot contains igniting rod which is usually hot enough for the pellets to start burning immediately and the smoke is then transported the created smokers, which the cooks food by the convection heating. The smoke surrounds them enough to feed that smoked flavor. It is what makes this Traeger smoker genuinely outstanding and peculiar. This Traeger Junior Elite has been proven to work well as it was designed to work. The auger is designed to smoothly transfer the pellets to the firebox which burns up the pellets effectively and efficiently. Namely, the quality of this Traeger Junior elite smoker is excellent. The heavy-duty steel used in making it enables it to store a lot of smoke and heat inside. The construction is very smooth, apart from the few rough surfaces that have a little effect on the finish. Although some of the cases from different owners report that the grill didn't work as expected, the grill malfunctioning is very rare. The great thing about Traeger Junior elite smokers is that they are very portable to handle, unlike Traeger Renegade Elite. Its set of two wheels which are built at the back and the two legs makes it movable, so one can relocate the smoker to a more convenient location one needs. The two wheels built with the smoker are not very for transporting it along with several pellets but are just great ways to move the smoker around in a given location. This a little different from grills like Traeger Tailgater which has foldable legs, enabling it to run around more efficiently compared to this. Moreover, this junior elite grill is very portable, with a weight of about 60 lbs, makes it even lighter compared to lots of other pellet smokers in the industry. Especially relevant, is the fact that the Traeger junior elite pellet smoker is much known for the ease of operation. They designed to be easily operated like the Traeger Renegade Elite, from lighting the smoker to automatic temperature regulation that is inbuilt. It not only for this smoker but for almost every Traeger product which is in the market today. When you order the Junior Elite, it comes in a box which contains various parts that are needed to be assembled. This assembly is tedious and requires some time to complete. It is the part of owning this smoker which is a bit arduous. Although there are excellent instructions online, that will enable you to finish this assembling job in less than one hour. When you are done with assembling the smoker, you need to prepare a power source from a suitable electrical output. Like Traeger Renegade Elite this electric power is used to power up the auger and the thermostat. It is not for heating the elements like the other electric smokers. So it consumes just a little necessary to keep the auger running smoothly. It will also enable smooth operation of the smoker, even to those with no experience in running smokers. The only thing required by now is adding up the pellets in the hopper, then set up the temperature you need, then let in do the rest. You can also use the temperature charts available to ensure that you get to use the right temperature. The only little struggle will maintain the temperature fluctuation, but the changes won't be that serious. The Traeger Junior Elite smoker has the best features we have seen, but these features don’t make it extremely expensive. The smoker can easily be accessed, and it’s very affordable like Traeger Renegade Elite and other from Traeger products. So whether you have purchased your new Traeger grill like Traeger Renegade Elite or maybe you are planning to get one soon. By now you might be running with lots of questions on how to effectively use the grill to smoke your first meal. Issues like: how to fire up and kick-start your grill? What kind of pellets to use when you need to burn that meal you are thinking of? These are some of the few things you might need some necessary information, so I have compiled some of the information that will help you kick-start your smoking experience. First and foremost, you should understand that the pellets used in your grill not only provides the fuel to burn but are also sources for the flavor. So you should know this vital factor before thinking otherwise. Make sure that the pellets you use are those from Traeger. This is because if you use other pellets from a different brand, you will void your Traeger given warranty. It is also because these pellets were explicitly designed to operate in the Traeger grills, for maximum efficiency. While the use of other branded pellets voids one's warranty, but this doesn’t stop people from using different brands. Q-pellets, Cookinpellets and other brands out there are still used by most pit masters in smoking and grilling. So you are the one to decide whether you are willing to take the risk, and try other brands out there or stick with Traeger. Although switching to different brands will also give you the freedom to work different flavors, from other brands in the market. So you decide. With that being said, let’s now look on the step by step guide on how to get your first smoking experience going. Start by plugging in your smoker; while this may seem too obvious, you should know that the Traeger has an electric smoker. After plugging in the smoker then make sure the dial is turned to the smoke setting. The smoker setting is designed to smoke foods, so it will by design hold the temperature between 180 to 200 F. So make sure this setting is on. Make sure the auger is spinning correctly before you proceed. The auger has been designed to feed the burner with pellets from the pellet tray. Don't attempt to put the pellets into the burn with your bare hands. Doing this could result in injury, and you don't want to get injured in your smoking experience. Make sure that the air blown out of the burner is heating up. At this point, you can use your hand carefully to feel the air blowing out of your pellet burner. You can notice the fire pot heating up just by observing the mild smoke coming off. However, as the heating up continues, it will eventually turn red. Pour now the pellets to the pellet box, the return the greased pan, the baffle and the grill trays back in the smoker. Depending on the number of your pellets, you can fill the pellets box all the way to the top. After that, you can now close the lid of your smoker and set it high. For 45 minutes, and with the lid closed to let it smoke on high. This will enable the smoker to the season. With this information, you will be able to run your first smoking adventure at ease smoothly. Just make sure that safety is taken into great consideration when dealing with Traeger grills. One of the significant advantages one get when using the Traeger pellets grills like Traeger Renegade Elite is that the temperature is always stable. Although sometime the temperature may begin to swing, so it’s best to stay informed. Something to note though, if the temperature begins to swing, instead of starting to panic, take your time and observe if this is a problematic issue or not. So don’t start prodding and poking around trying to find the source of the problem before this consideration. The temperature that is claimed to be maintained by the smoker is usually the average temperature throughout the entire cook. Keep this in mind before coming up with conclusions if things go otherwise. Therefore while the thermometer that comes with the smoker is usually very accurate, but the temperature variations are quite normal during the cook. The smoker is promised to have a precise temperature range of -/+ 20 degrees. The temperature of the smoker may be affected by the environment around, for instance; the wind, direct sunshine or shades, these can all alter the temperature of your smoker. Other than these general considerations to note, another issue to observe when trying to address the problem of temperature variations is the pellets. When you use poor quality pellets, they will produce more ash. That means the probe will also struggle to get an accurate reading; it will also prompt the Traeger auger to feed in many pellets into the firebox of the grill. Another issue that one might want to consider to check is the drip pan, heat diffuser as well as the fire pot. If probably overtime these parts have corroded the oxygen flow changes and the hot spots could lead to spikes in the heat. However, this won't happen if the Traeger is new. Sometimes the problem could also be the RTD probe. So you can also use a digital thermometer to be able to determine if that is the case. Some of the Traeger grill owners sometimes usually report the question of free movement of the pellets from the pellet box to the auger. They indicate that the change may lag and the pellets won't move freely. With this situation, one will observe sudden temperature drops. However, this issue can be solved by a pure redistribution of pellets in the pellet box. Every barbecue grill requires proper maintenance; otherwise, you won't enjoy the durability of the rack. So with the Traeger grills, there are some things to keep in mind while maintaining the grill and storing your pellets. The most important factor to avoid when deciding how to store your pellets are moisture. Namely, the moisture could result in your pellets becoming useless. Make sure that you don't leave your pellets in the pellet box for an extended period. Moreover, when storing them, find a dry location. For those who live in a cold climate, this consideration is of vital importance. If that happens, then they will swell and begin breaking down to sawdust. The auger might as well freeze up and completely mess things around, to even require dismantling it down to fix it. Hence, it is essential to ensure that your drip tray is well covered with aluminum foil. Thus, this will enable easy cleaning of the dish. Use warm soapy water to effectively clean your grill plate or drip tray with a kitchen sponge. Traeger Company has brought a great revolution in the grilling and smoking world. The great thing about these grills is that they are affordable and accessible to use. Namely, one can acquire one and easily install the rack by following the manuals available, then start enjoying the grilling and smoking experience from Traeger. The full range selections, from Traeger Renegade Elite to other great Traeger pellets grills will give the user a wide range of options.